A better way to browse your video content. 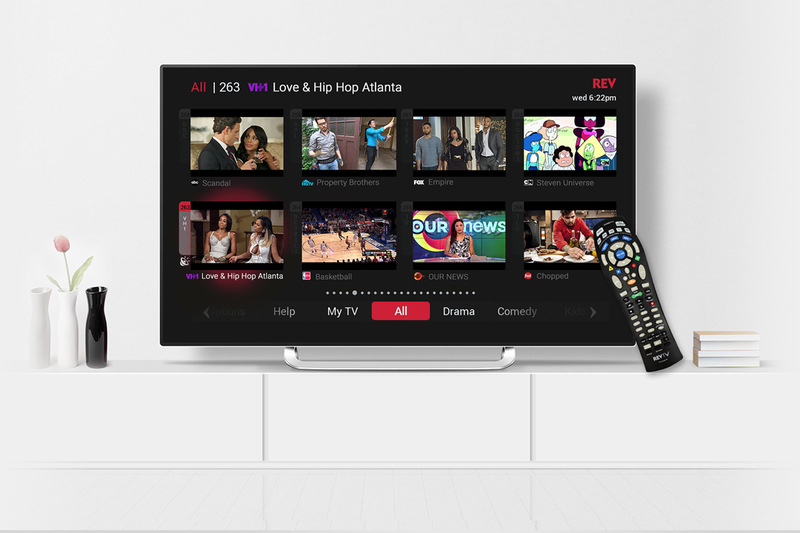 What’s On REV delivers live video previews of content showing on available channels. You can access What’s On REV by pressing the B key on your remote. The initial, default view lists all channels in numerical order. Genre-based mosaics are also available to quickly find programming based on a genre of interest. Up to five personalised mosaics can be created by adding any available channels. Personalised mosaics can be given names and assigned background images that will be displayed for each mosaic. The built-in Help Section reduces customer support inquiries by providing user support directly within the PVM. What is What’s on REV? What’s on REV (WOR) can be found on channel 200. It delivers a graphically rich, intuitive mosaic guide that can be personalised by subscribers. Is WOR the same as my on-screen TV guide? What’s on REV is an alternative way to display your TV content. It displays a mosaic of live video tiles that represent linear programming. WOR provides a number of different ways in which the end user can choose to browse broadcast content, from a traditional numerical order, to genre-based mosaics, or even personally created mosaics that can be saved for ongoing use. Do I need to pay any additional costs to get this upgrade? No. WOR is available FREE to all REVTV subscribers. How do I find WOR? Simply go to channel 200 or press the “B” key on your remote to access WOR. Can I view all channels in WOR? All channels listed on the guide can be viewed on WOR. Viewers can select video content based on channel number and genre. With WOR users are able to preview up to eight channels on the screen at the same time. Is WOR compatible with HD and SD resolutions? Yes. WOR is compatible with both HD and SD resolution set-top boxes. HD resolution provides eight tiles per screen, while SD resolution provides six tiles per screen. Does the video tile have audio? As you navigate through each live tile within the mosaic, audio from the tile that is focused on will play. Audio changes to the focused tile as you continue to navigate through the mosaic tiles. When you see something that interests you, select that mosaic tile and your set top box will tune to the selected channel. You can continue watching the program. How do I personalise WOR? You are able to create your own mosaics by first selecting the channels you would like to be available, then assigning a name and background to each customized mosaic view. This allows you to create individual mosaics for family members, day of week, time of day, or whatever other reasons you may have – creating ultimate flexibility. How do I get additional assistance on WOR? A help section is included in WOR in the event that you need help in navigating, creating personalised mosaics, or understanding the various mosaic views. Simple, easy-to-follow tips and instructions are included in the help section. Our REV agents are also available to assist at any time.